This name uses Spanish naming customs: the first or paternal family name is Ramón and the second or maternal family name is Cajal. Santiago Ramón y Cajal (Spanish: [sanˈtjaɣo raˈmon i kaˈxal]; 1 May 1852 – 17 October 1934) was a Spanish neuroscientist and pathologist, specializing in neuroanatomy, particularly the histology of the central nervous system. He and Camillo Golgi received the Nobel Prize in Physiology or Medicine in 1906, with Ramón y Cajal thereby becoming the first person of Spanish origin who won a scientific Nobel Prize. His original investigations of the microscopic structure of the brain made him a pioneer of modern neuroscience. Hundreds of his drawings illustrating the delicate arborizations of brain cells are still in use for educational and training purposes. Santiago Ramón y Cajal was born 1 May 1852 in the town of Petilla de Aragón, Navarre, Spain. His father was an anatomy teacher. As a child he was transferred many times from one school to another because of behavior that was declared poor, rebellious, and showing an anti-authoritarian attitude. An extreme example of his precociousness and rebelliousness at the age of eleven is his 1863 imprisonment for destroying his neighbor's yard gate with a homemade cannon. He was an avid painter, artist, and gymnast, but his father neither appreciated nor encouraged these abilities, even though these artistic talents would contribute to his success later in life. His father apprenticed him to a shoemaker and barber, to "try and give his son much-needed discipline and stability." He was well known for his pugnacious attitude as he worked. 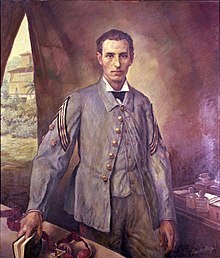 Ramón y Cajal as a young captain in the Ten Years' War in Cuba, 1874. Ramón y Cajal attended the medical school of the University of Zaragoza, where his father was an anatomy teacher. He graduated in 1873, aged 21. After a competitive examination, he served as a medical officer in the Spanish Army. He took part in an expedition to Cuba in 1874–75, where he contracted malaria and tuberculosis. In order to heal, he visited the Panticosa spa-town in the Pyrenees. After returning to Spain, he received his doctorate in medicine in Madrid in 1877. In 1879, he became the director of the Zaragoza Museum, and he married Silveria Fañanás García, with whom he had seven daughters and five sons. Ramón y Cajal worked at the University of Zaragoza until 1883, when he was awarded the position of anatomy professor of the University of Valencia. His early work at these two universities focused on the pathology of inflammation, the microbiology of cholera, and the structure of epithelial cells and tissues. In 1887 Ramón y Cajal moved to Barcelona for a professorship. There he first learned about Golgi's method, a cell staining method which uses potassium dichromate and silver nitrate to (randomly) stain a few neurons a dark black color, while leaving the surrounding cells transparent. This method, which he improved, was central to his work, allowing him to turn his attention to the central nervous system (brain and spinal cord), in which neurons are so densely intertwined that standard microscopic inspection would be nearly impossible. During this period he made extensive detailed drawings of neural material, covering many species and most major regions of the brain. In 1892, he became professor at Madrid. in 1899 he became director of the Instituto Nacional de Higiene – translated as National Institute of Hygiene , and in 1922 founder of the Laboratorio de Investigaciones Biológicas – translated as the Laboratory of Biological Investigations , later renamed to the Instituto Cajal, or Cajal Institute. He died in Madrid on October 17, 1934, at the age of 82, continuing to work even on his deathbed. In 1877, the 25-year-old Ramón y Cajal joined a Masonic lodge. :156 John Brande Trend wrote in 1965 that Ramón y Cajal "was a liberal in politics, an evolutionist in philosophy, an agnostic in religion". Nonetheless, Ramón y Cajal used the term soul "without any shame". He was said to later have regretted having left organized religion,: 343 Ultimately, he became convinced of a belief in God as a creator, as stated during his first lecture before the Spanish Royal Academy of Sciences. 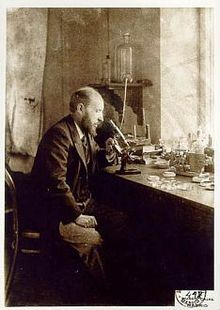 Ramón y Cajal in his laboratory. Ramón y Cajal made several major contributions to neuroanatomy. He discovered the axonal growth cone, and demonstrated experimentally that the relationship between nerve cells was not continuous, but contiguous. This provided definitive evidence for what Heinrich Waldeyer coined the term neuron theory as opposed to the reticular theory. This is now widely considered the foundation of modern neuroscience. He was an advocate of the existence of dendritic spines, although he did not recognize them as the site of contact from presynaptic cells. He was a proponent of polarization of nerve cell function and his student, Rafael Lorente de Nó, would continue this study of input-output systems into cable theory and some of the earliest circuit analysis of neural structures. By producing excellent depictions of neural structures and their connectivity and providing detailed descriptions of cell types he discovered a new type of cell, which was subsequently named after him, the interstitial cell of Cajal (ICC). This cell is found interleaved among neurons embedded within the smooth muscles lining the gut, serving as the generator and pacemaker of the slow waves of contraction which move material along the gastrointestinal tract, mediating neurotransmission from motor neurons to smooth muscle cells. In his 1894 Croonian Lecture, Ramón y Cajal suggested (in an extended metaphor) that cortical pyramidal cells may become more elaborate with time, as a tree grows and extends its branches. He devoted a considerable amount of time studying French which he used to help his wife during labor and parapsychological phenomena. A book he had written on these topics was lost during the Spanish Civil War. Ramón y Cajal's efforts to improve the state of scientific research and education in Spain were part of a broader preoccupation with Regenerationism among Spanish intellectuals. Bust of Santiago Ramón y Cajal in Burgos. Ramón y Cajal received many prizes, distinctions, and societal memberships during his scientific career, including honorary doctorates in medicine from Cambridge University and Würzburg University and an honorary doctorate in philosophy from Clark University. The most famous distinction he was awarded was the Nobel Prize in Physiology or Medicine in 1906, together with the Italian scientist Camillo Golgi "in recognition of their work on the structure of the nervous system". This caused some controversy because Golgi, a staunch supporter of reticular theory, disagreed with Ramón y Cajal in his view of the neuron doctrine. Even before Ramón y Cajal's work, Norwegian scientist Fridtjof Nansen established the contiguous nature of nerve cells in his study of certain marine life, which Ramón y Cajal failed to cite. Ramón y Cajal, Santiago (1905) . Manual de Anatomia Patológica General (Handbook of general Anatomical Pathology) (in Spanish) (fourth ed.). Ramón y Cajal, Santiago; Richard Greeff (1894). Die Retina der Wirbelthiere: Untersuchungen mit der Golgi-cajal'schen Chromsilbermethode und der ehrlich'schen Methylenblaufärbung (Retina of vertebrates) (in German). Bergmann. Ramón y Cajal, Santiago; L. Azoulay (1894). Les nouvelles idées sur la structure du système nerveux chez l'homme et chez les vertébrés' ('New ideas on the fine anatomy of the nerve centres) (in French). C. Reinwald. Ramón y Cajal, Santiago; Johannes Bresler; E. Mendel (1896). Beitrag zum Studium der Medulla Oblongata: Des Kleinhirns und des Ursprungs der Gehirnnerven (in German). Verlag von Johann Ambrosius Barth. Ramón y Cajal, Santiago (1898). "Estructura del quiasma óptico y teoría general de los entrecruzamientos de las vías nerviosas. (Structure of the Chiasma opticum and general theory of the crossing of nerve tracks)" [Die Structur des Chiasma opticum nebst einer allgemeine Theorie der Kreuzung der Nervenbahnen (German, 1899, Verlag Joh. A. Barth)]. Rev. Trim. Micrográfica (in Spanish). 3: 15–65. Ramón y Cajal, Santiago (1899). Comparative study of the sensory areas of the human cortex. p. 85. Archived from the original on 10 September 2009. Ramón y Cajal, Santiago (1899–1904). Textura del sistema nervioso del hombre y los vertebrados (in Spanish). Madrid. ——. Histologie du système nerveux de l'homme & des vertébrés (in French) – via Internet Archive. ——. Texture of the Nervous System of Man and the Vertebrates. Ramón y Cajal, Santiago (1906). Studien über die Hirnrinde des Menschen v.5 (Studies about the meninges of man) (in German). Johann Ambrosius Barth. Ramón y Cajal, Santiago (1937). Recuerdos de mi Vida (in Spanish). Cambridge: MIT Press. ISBN 84-206-2290-7. In 1905, he published five science-fiction stories called "Vacation Stories" under the pen name "Dr. Bacteria". The asteroid 117413 Ramonycajal has been named in his honor. In 2014, the National Institutes of Health exhibited original Ramón y Cajal drawings in its Neuroscience Research Center. An exhibition called The Beautiful Brain: The Drawings of Santiago Ramón y Cajal travelled through the US beginning 2017 at the Weisman Art Museum in Minneapolis ending April 2019 at the Ackland Art Museum in Chapel Hill, North Carolina. A short documentary by REDES is available on YouTube Spanish public television filmed a biopic series to commemorate his life. First illustration by Cajal (1888) of the nervous system. (A) First page of the article. (B) Vertical section of a cerebellar convolution of a hen. (C) Cerebellum of an adult bird. (D) Higher magnification of (C) showing Purkinje cell. (E) Dendrite of the Purkinje cell. schema of the visual map theory (1898). O=Optic chiasm; C=Visual (and motor) cortex; M, S=Decussating pathways; R, G: Sensory nerves, motor ganglia. ^ "The Nobel Prize in Physiology or Medicine 1906". NobelPrize.org. ^ "History of Neuroscience". Society for Neuroscience. Archived from the original on 2008-05-15. Retrieved 2008-10-09. ^ A Mind for Numbers. Tarcher Penguin. p. 193. ISBN 978-0-399-16524-5. ^ a b c d Finger, Stanley (2000). "Chapter 13: Santiago Ramón y Cajal. From nerve nets to neuron doctrine". Minds behind the brain: A history of the pioneers and their discoveries. New York: Oxford University Press. pp. 197–216. ISBN 0-19-508571-X. ^ a b c d e f g h i Nobel lectures, Physiology or Medicine 1901-1921. Amsterdam: Elsevier Publishing Company. 1967. Retrieved 2013-01-29. ^ Sherrington, C. S. (1935). "Santiago Ramón y Cajal. 1852-1934". Obituary Notices of Fellows of the Royal Society. 1 (4): 424–441. doi:10.1098/rsbm.1935.0007. ^ Yuste, Rafael (21 April 2015). "The discovery of dendritic spines by Ramón y Cajal". Frontiers in Neuroanatomy. 9 (18). doi:10.3389/fnana.2015.00018. PMC 4404913. PMID 25954162. ^ Carolyn Sattin-Bajaj (2010). Marcelo Suarez-Orozco (ed.). Educating the Whole Child for the Whole World: The Ross School Model and Education for the Global Era. NYU Press. p. 165. ISBN 9780814741405. In that sense, it was interesting to learn that Santiago Ramón y Cajal, the great pioneer of modern neuroanatomy, was agnostic, but still used the term soul without any shame. ^ "Las creencias de Darwin y Cajal | Amigos de Serrablo". Serrablo.org. 2009-03-31. Retrieved 2015-03-15. ^ "FANZCA part I notes on the Autonomic Nervous System". Anaesthetist.com. Retrieved 2015-03-15. ^ J. S. Edwards & R. Huntford (1998). "Fridtjof Nansen: from the neuron to the North Polar Sea". Endeavour. 22 (2): 76–80. PMID 9719772. ^ Otis, Laura (11 March 2007). "Dr. Bacteria". LabLit.com/article/226; Published 11 March 2007. Wikimedia Commons has media related to Santiago Ramón y Cajal. The Nobel Prize in Physiology or Medicine 1906 Nobel Prizes and Laureates. n.d. This page was last edited on 25 March 2019, at 14:05 (UTC).